When you inked in that tattoo, you probably never thought that the day would come when you won’t want it anymore. But hey, here you are now and you want your tattoo removed. The good news is that it’s quite possible to remove your tattoo. So, what are the tattoo removal techniques available? Let’s begin from the tattoo removal technique your grandma would have used. Dermabrasion is a fusion of two words –dermis (the inside layer of the skin) and abrasion (to scrape). 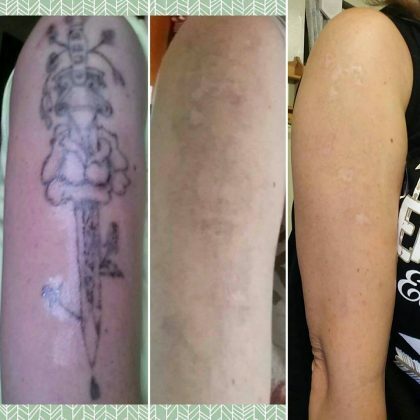 So, this simply involves scraping away or sanding down the tattoo area using a rotating brush or a chemical peel. A painful process as you would have imagined! This involves rubbing a salt solution into the skin, applying some heat and then scrapping away the tattoo. Both dermabrasion and salabration leave you with scars after the wound must have healed. Surgically removing a tattoo involves cutting out the tattooed skin and sewing the surrounding skin back together. This technique is often used for tiny tattoos but may also leave you with a scar. In cryosurgery, the tattooed area is freeze-burned with liquid nitrogen. This technique is also referred to as cryotherapy and is sometimes used to treat warts and other skin injuries. This involves getting an artist to cover up an older tattoo with a new one. Success will depend on the skill of the tattoo artist as well as the on the size, style, colors and techniques used on the old tattoo. Cover-up will not work for very dark tattoos as darker tones are required in the new tattoo to effectively hide the unwanted piece. A similar method known as Scarification involves using Trichloroacetic acid (TCA) to remove the tattoo so that the resulting scar can cover up the ink left on the skin. Here, the tattoo pigments are broken down into particles tiny enough for the skin to absorb. To achieve this, laser rays are beamed on the skin to searches out differences between skin tone and ink. Ink colors that contrast deeply with the skin are easier to remove than fluorescent colors. For example, black ink on a light-skinned person is easier to remove, while turquoise, purple and yellow are very difficult to erase. Smaller or older tattoos are also easier to remove because the ink is easier to break down. On the average, laser treatment may require up to 12 sessions with a month interval between each session. You should, therefore, be looking at between 6 to 12 months of treatment. With proper laser protocols and good patient aftercare, Q-switched laser treatment not likely to give you a scar except there was a scar present before the treatment.